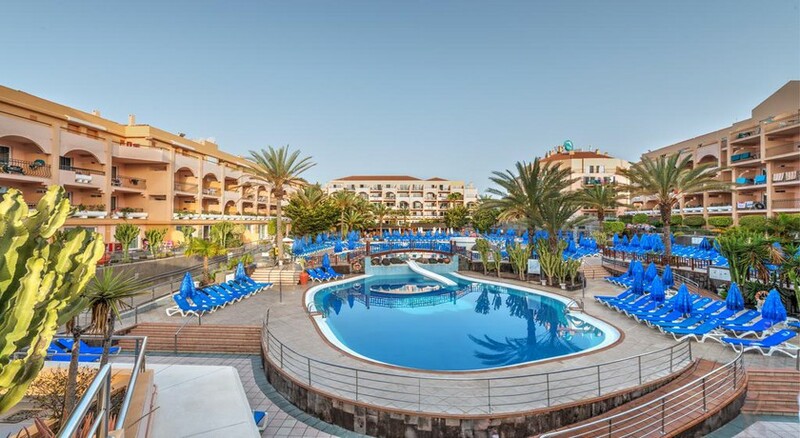 Jet off to the sunny island of Gran Canaria and stay in this modern yet elegant hotel which boasts of two large interlinked swimming pools, ample sun loungers and a variety of sports facilities. 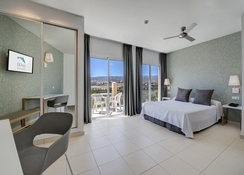 Dunas Mirador Maspalomas Hotel is situated just 3.5km from the beach and just 2km from the traditional town of Playa de Ingles, both of which have attractions for adults and children. The complex is surrounded by shopping centres, bars, restaurants and shops. The hotel features spacious guestrooms fitted with all the necessary amenities. It also features a heated swimming pool along with a pool bar serving delicious cocktails. 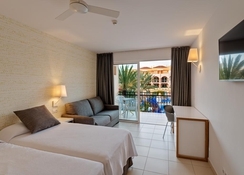 The Dunas Mirador Maspalomas Hotel is about 6km from well-known town of Playa del Inglés. It is the most appreciated beach in Gran Canaria with buildings of interest such as Ermita de San Fernando de Maspalomas, Casa Condal and the Black Basalt Lighthouse. At just 15km, it is possible to get an idea of ​​the indigenous inhabitants of the island by visiting the necropolis of Arteara. Nearby are interesting towns such as Mogán, with its black sand beach in a beautiful natural enclave (28km); Agüimes, former lordship of the Bishops of the Canary Islands (31km) and Telde, the second city of Gran Canaria in terms of population (44 km). 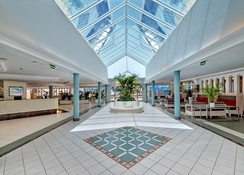 The Gran Canaria Airport is at a distance of about 32km from the hotel. The modern Dunas Mirador Maspalomas Hotel is distributed in six five storied buildings. Guests can choose from over 400 guestrooms that have additional sofa beds and 26 family rooms with comfortable lounges. The rooms overlook the pool or the surroundings, thanks to the balcony or the terrace. 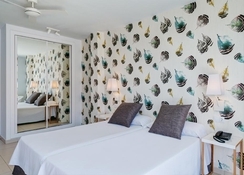 The bathroom has a bathtub, and the rooms have been equipped with a television with satellite channels, a ceiling fan and a telephone, among other amenities. Probably the coolest place to be in the hotel is the poolside bar. Guests can enjoy freshly made burgers, pizzas, sandwiches and salads along with a delectable selection of hot and cold snacks as they take a refreshing dip in the pool. The hotel also has a buffet restaurant on the premises which serves breakfast, lunch and dinner. Dunas Mirador Maspalomas Hotel offers two outdoor swimming pools (one of them heated) connected by a slide, with a separate area for children, a terrace for sunbathing, equipped with sun beds and umbrellas and a pool bar. Indulge in opportunities to practice some sports or leisure activities, some of them for an additional fee: ping-pong, tennis, archery, cycling, volleyball, billiards or massages. Make the most of free transportation to the beach four times a day. Guests can also enjoy Wi-Fi throughout the hotel (with charge), along with services of a mini-club and a beauty and massage centre. What a great hotel. Was tgere in July 2017 with myself parter and two boys. Pool was big and the kids never wanted to get out. Rooms clean and spacious with lovely pool view. Was all inclusive and not dissaponted. San miguel and vodka Inc. Breakfast was more geared to Europeans but food was plenty and lovely. Snack bar had hot dogs burgers pizza and chips everyday. U never went hungry or thirsty. Taxi to the beach but just asked in reception for a taxi and it appeared at the lobby in 30 seconds. Never waited. Same coming back from beach. Would most definately go here again. The hotel was exactly what I expected. Staff were good and food selectiob good, Thought bar closed a littel early, Staff were good and rooms wre good. I would return there. Lovely, lively hotel, great for kids, great staff and food. Good value for the price! Nice spacious room and ensuite facilities. Restaurant food is good and varied. Buses to beach are useful to help costs. Lovely poolside for relaxing by..